Thanks to their maiden win of the season, the Precote Herberth Motorsport pilots now rank second in the drivers’ classification. Klaus Bachler and Adrien de Leener also brought home a podium result with third place and celebrated the best result of the season for their KÜS Team75 Bernhard squad. The newcomer team IronForce by Ring Police crossed the finish line in position 18 and won in the Trophy category. Already in the morning qualifying, Porsche-supported Jaminet delivered a flawless performance on the storied 4.307-kilometre racetrack and scored the first pole position for the 911 GT3 R in this year’s ADAC GT Masters. As the start driver, the Frenchman defended his lead effortlessly. After 16 laps and while holding the lead, Jaminet handed the car over to his German teammate, Renauer. The Bavarian used his experience from 105 ADAC GT Masters races and also managed to pull clear of his pursuers after a safety car phase. This marks the sixth victory for Renauer in the super sports car league. “That was a perfect day for us: pole position, victory and the fastest race lap. Our crew did a fabulous job and the 911 GT3 R ran superbly. 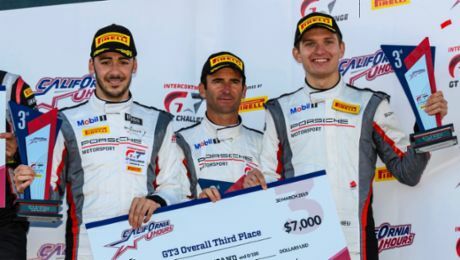 The maiden win for Porsche in this series in 2018 was very important for the whole team. Tonight we’re going to celebrate,” declared Jaminet. The 911 GT3 R with the starting number 18 crossed the finish line in third place and thus claimed a podium spot. Bachler from Austria and Belgian de Leener took up the race from third on the grid. After Bachler snatched one position in the sprint to the first corner at the start, the international driver duo later lost that position again and fell back to their original rank. Third place represents the best result so far this season for the KÜS Team75 Bernhard. “What a day! The balance of our car was perfect. We concluded the qualifying just one-hundredth of a second off pole position, and finished the race in third. I’m very happy,” said Bachler. The 911 GT3 R fielded by IronForce by Ring Police took up the race from P21 in drizzle and a temperature of 19 degrees Celsius. In the very first lap, Lucas Luhr (Germany) made up four places, however afterwards the traffic was simply too heavy for any further manoeuvres. Jan-Erik Slooten (Germany) took the wheel of the race car after 17 laps and crossed the finish line in 18th place. Thanks to scoring first in the Trophy category, Slooten retains his second place in the class for amateur drivers. “My start was good and I was able to gain some positions, but the track was very full. We wanted to delay coming into the pits for as long as possible but by the end of the stint the tyres were extremely worn,” said Luhr. Lady luck was not shining on the second 911 GT3 R fielded by KÜS Team75 Bernhard in Zandvoort. In a repeat of the previous day, the #17 racer retired early in the race after getting caught up an accident caused by another competitor. Marc Lieb (Germany) stood in for the regular driver Kévin Estre, who was contesting the WEC round at Silverstone this weekend. The former works driver and Head of Porsche Customer Racing took up the race from 27th on the grid however he had to park the car in the pits after three laps. “We weren’t able to show the full potential of the 911 GT3 R today. In qualifying I made a mistake on my flying lap, and in the race we were knocked out of contention – that was extremely annoying. From Porsche’s point of view, I’m delighted about the first win for Precote Herberth Motorsport and the podium result for the number 18 car. Mathieu and Robert got the most out of the race and are right in the middle of the fight for the championship,” said Lieb. The sixth race weekend of the ADAC GT Masters will be contested on the Sachsenring from 7 to 9 September. The 3.645-kilometre circuit in Saxony has been a regular fixture on the race calendar since the series’ debut season in 2007. Contesting the “super sports car league” alongside Porsche are Audi, BMW, Corvette, Ferrari, Honda, Lamborghini and Mercedes-AMG. Luck was not with the Porsche customer teams at round nine of the ADAC GT Masters in Zandvoort: In a race full of incident and drama, Porsche Young Professional Mathieu Jaminet and Robert Renauer of team Precote Herberth Motorsport finished twelfth. Sharing the cockpit of the second-best Porsche 911 GT3 R for Saturday’s race at the coastal circuit, Klaus Bachler and Adrien de Leener took the flag in 21st place for KÜS Team75 Bernhard. Start driver Renauer from Germany took up the 60-minute race on the 4.307-kilometre Circuit Zandvoort from 15th on the grid. In the first lap, the Bavarian made up three positions. After 13 laps, Renauer handed the 911 GT3 R to his teammate Jaminet. The Porsche-supported junior driver from France succeeded in making up even more ground, and crossed the finish line in tenth place. 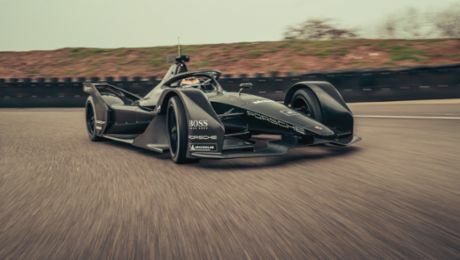 However, after contact with another vehicle, the team was handed a one-second penalty, which relegated the driver pair to twelfth. “We were going well early on, but various incidents cost us several places. In terms of performance, we could definitely have finished on eighth,” explained Renauer. Bachler (Austria) and the Belgian de Leener headed into the race from 30th on the grid in the #18 Porsche 911 GT3 R. Putting in a spirited performance, the two KÜS Team75 Bernhard drivers made up nine positions. “We experienced bad luck in the qualifying and we couldn’t achieve a decent time due to the many red-flag phases. Overtaking on this narrow circuit is extremely difficult, but we still managed to work our way up the field,” said de Leener. The newcomer team IronForce by Ring Police took the flag in 29th place. Jan-Erik Slooten and Lucas Luhr from Germany headed into the race from 31st and managed to make up six places before several collisions put a stop to their charge. “Already at the start there were a number of moves that didn’t exactly comply with the rules. We were plagued by bad luck. After the driver change, Lucas had a slow puncture and had to come into the pits. That cost us a lot of time,” explained Slooten. The race was over in lap four for the second 911 GT3 R fielded by KÜS Team75 Bernhard when it became entangled in a collision caused by another competitor. Joining the two-time overall Le Mans winner Timo Bernhard in the cockpit for this weekend is the World Endurance Champion Marc Lieb. Lieb stands in for Kévin Estre, who is contesting the FIA WEC at Silverstone this weekend. “The opening lap went well and I managed to gain three places. At the restart, another vehicle hit my right front wheel and broke the rim. Had this not happened we would have been able to finish further up the field,” declared Bernhard. Porsche has designed a customer sport race car for GT3 series: the 911 GT3 R.